So far 2017 has been a weird year. I started off wanting to do it all; now I simply feel like slowing it down. I always knew I would have a quarter life crisis, just never thought it would feel this overwhelming. 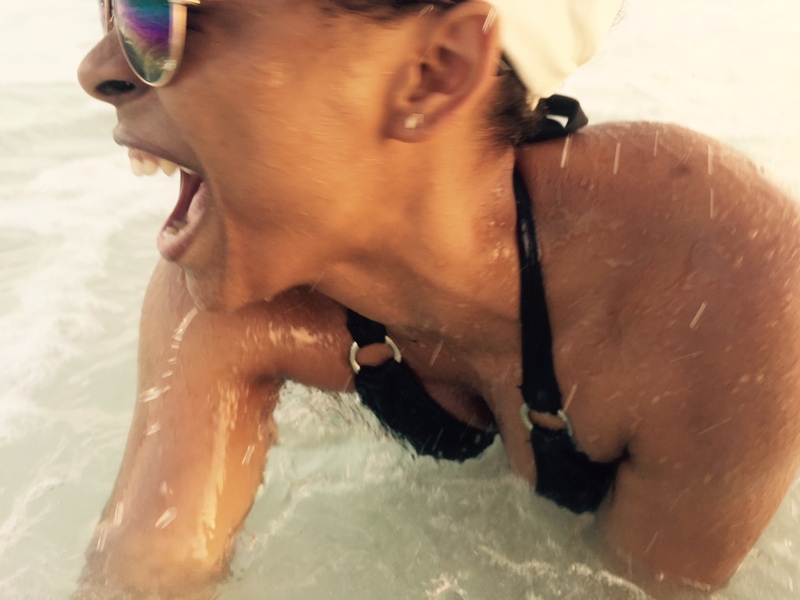 In May, when I went to Punta Cana in the Dominican Republic, I felt the need to take a few steps back, analyze and slow things down. For those who are not familiar with the Dominican Republic, Punta Cana is a resort town located in the municipality of Higüey, in La Altagracia Province. I was super excited because this would be my first time in Punta Cana. I took the trip with my best friend Shakia and my sorority sister Jadira. After the ultimate struggle to book everything, we managed to find a round trip flight with Dominican Wings and stay at Meliá Caribe Tropical all inclusive resort. We did two excursions. The buggy ride with Adventure Boogies and a boat ride to Saona Island. On our way to Saona, our questionable transportation ride stopped at a gas station, which had the cutest little cafe. There, I had the best Yuca Pastelito I have ever tasted! Eventually, we made it to the dock site where we got on a speed boat and headed towards some shallow waters. Once we arrived, Shakia and I managed to hop into the ice cold water and take a few pics with some Star fishes. Miraculously, right after that, what was supposed to be a gloomy rainy day turned into a day filled with bright sunshine. Right on time for Saona. Saona Island was extremely touristic. While we were there, I learned that the vendors are only allowed to make a living from the tourism. I ended up buying my aunt a bracelet made out of Larimar, a gemstone only found in the Dominican Republic. It makes you really think about the importance of tourism for some countries. My favorite part was the Yacht ride back to Higüey. Despite the music and the people getting drunk on cheap rum and coke, I felt such a peacefulness. I loved every second of it. I even enjoyed a few dances with an Argentinian man who was sitting next to me. I have come to realize that it’s the simple moments that I appreciate the most. Life is merely but an arrangement of moments, both good and bad. While at Meliá, if I wasn’t drinking a Coco Loco, I was sipping on a Cosmo. If I wasn’t eating, then I was most likely laying on the beach or enjoying the pool. I mingled a lot with the staff and learned quite a few things about life in DR. It still makes me laugh when I think about how different you are considered if you are Dominican-American, like myself. Though the same yet different, but then again we all are different. Overall, it was a good vacation. It made me really put 2017 into perspective and brought into light the need to go slower. There’s still a lot I have to figure out, but you have to start somewhere, right? This entry was posted in 25th Year, Travels and tagged adventure, amazing, beach, beautiful, carribbean, changes, dominican republic, Excitement, experiences, explore, exploring, Friends, fun, Happy, inspiration, Latina, Latina Blogger, LatinaBloggers, learning, Life, life lessons, lifestyle, Photography, places, Positivity, possibility, postaday, punta cana, self, self-acceptance, Self-Discovery, Self-Love, simple, things to do, travel, traveling, vacation on August 27, 2017 by SimplyTiff. 2017 came around; I found myself standing and the world around me spinning. It was one of those things where I wanted to take a hold of everything; all at once. It took me until the end of March to realize that in my attempt to grab everything, I just got dizzier as I barely held on to anything. School, work, traveling, bills, trying new hobbies, self-care…I thought I could do it all. Yea, I thought wrong. Time sped and here we are at the end of April. So much for not having a quarter life crisis. Well as I sit here reflecting on the past few months, I look back to February when a group of friends and I took a trip to Montreal, QC, Canada. Montreal was perfect from the culture to the scenic views. At this time, I didn’t know I was on a spinning spree, but this trip was refreshing; made me even more addicted to traveling and getting away. It was five of us; not everyone was familiar with each other, but we all started the journey with an open mind. We decided to make it a mini road trip and left before the sun was even awake (four of us; one was flying and meeting us there.) It was a nice drive and we didn’t hit not one ounce of traffic which, we loved. While waiting at the border we cracked opened our windows, to take pictures of the Canadian flag, and the air felt fresher. It was like breathing in a sense of relief and exhaling all my problems and discontent. I felt happy. As soon as we crossed the border the signs changed from English to French. I celebrated. Anyone who knows me knows that I become super excited whenever I see or hear anything related to the French language or culture. I was ready to practice speaking all weekend! Yes, I was about to get on everyone’s last nerve…in a good way though! When we arrived, we couldn’t find parking for the life of us. Guess some things just don’t change in any country. Well when we finally did and figured out the ridiculously expensive street parking situation, turns out our Airbnb wasn’t even ready. So there we are looking like we just woke up and needing showers, in uggs, stepping on slushy snow. So what we do? We decided to walk and search for food and booze. Our first stop was Station 16 Gallery. Contemporary art at its finest. Everything was bold and provocative. Self-expression to the max. Check out the site. It’s worth a look. After the gallery and stopping at a few boutiques, we found a place to eat. McKibbin’s Irish Pub turned out to be the perfect place to have our first drinks. I had a beer (of course) and everyone else had Irish Coffee. I think this is where it finally hit us that we were in Canada. Eventually, we got dressed and looked civilized. It felt amazing. Also, let me not forget to mention how in LOVE I was with our Airbnb. If I could dream up my own apartment it would look exactly like the place we were staying in. We went to the airport to pick up the last person missing from our group, Jadira, who apparently was stranded, with a dead phone and not knowing any valid French to communicate. It was quite funny especially because she was coming straight out of her intro to French course. Well once she was rescued, we headed straight for Old Montreal where Igloo Fest was taking place at Jacques-Cartier Pier. It was a great beginning to our night! We enjoyed a beautiful picturesque walk around Old Montreal. We stumbled across a cute small restaurant, Restaurant Le Fripon, where we had Canadian beer and snails….YES, snails. It tasted okay…I think it was the cheese and garlic; a little chewy for the most part. When we finally got to Igloo Fest it looked like one of those raging festivals I had no business being at. Fortunately, It wasn’t that hectic (EDM just isn’t my thing and neither is raging.) We took some shots, enjoyed the outside view and headed back to get ready for the rest of our evening. We ended our Saturday at Muzique, which turned out to be across the street from where we were staying. Okay, so what I learned? When a country allows drinking and partying at 18+ DO NOT go out clubbing. Unless you specifically know it’s a school night and the kids will be in bed. I felt like I was at a college party. It was incredibly crowded and everyone was out of control. The funny part is that the bouncer let us skip the line because we were 21+. Ironic right? We made the best of it by dancing and laughing at what was happening around us. Felt like a teen movie could have been made out of it all the wild things we saw. Sunday welcomed us with perfect (not so cold) weather. We went to Fabergé for brunch where we probably waited about an hour or more to get seated. The place was small and the line was long (felt like a good sign.) It was absolutely worth it! We had the most delicious Poutine (potatoes with gravy and cheese,) and ate so much food it was somewhat ridiculous! Shrugs. I’m sure we would all do it again without thinking twice! Next stop was Mount Royal. First, i’ll let the pictures speak for themselves. The view was absolutely spectacular and truly breathtaking. I couldn’t stop staring at it. In that moment, I wanted to stay in Canada. It was covered in cold and frost but filled with serenity. I can close my eyes and feel the happiness I felt from looking at Montreal. Moments like that is why I love to travel. We headed back to Old Montreal where we stopped to take a few pictures of the Notre-Dame Basilica, the first Gothic revival style church to be built in Canada. Old Montreal is spectacular. It looked even more beautiful in the rain…something about the wet cobblestone made it look more alive. We went to Les 3 Brasseurs for dinner. It was probably the most fun we had thus far during our trip! We started off with the beer sampler, which had a mix of white, blonde, amber, brown and IPA beers. How we managed to taste ALL the beers? Let’s just say we decided to “Be-er about it…” sip and pass until the cup was empty! We finished before we even got our main courses. That night, for some odd reason, we decided to give clubbing another try. We started off at Tokyo Bar and ended at Apartment 200. I guess because it was a school night, there were barely any kids out! So yes, the night was a total success and a complete 180 from Saturday night. I had so much fun that by the end of the night, I shed a few tears because I didn’t want to go home. It was definitely bittersweet for it to be the last night; yet such a fun night. Waking up on Monday was a bit difficult but we managed to leave by 11am. Before hitting the road we picked up some smoked meat at Schwartz Deli and some more Poutine for me. It was tasty just too much meat for a small piece of bread. … but with the last bites of our sandwich ended our trip in Montreal. We walked to the car, got lost trying to buy some souvenirs and off we were to our 6-hour drive back home. It was a nice getaway, but it left me wanting more. I wanted more adventure and more moments to capture. Therefore, my spinning continued and I quickly started planning my next trip. This entry was posted in 25th Year, Travels and tagged beautiful, beer, canada, changes, Excitement, experiences, explore, exploring, fun, Happy, inspiration, language, languages, laugh, Life, life lessons, lifestyle, montreal, Photography, photos, places, possibility, postaday, quebec, random, scenery, stories, story, things to do, Thoughts, travel, traveling on April 21, 2017 by SimplyTiff. It never ceases to amaze me how quickly time flies. One minute I’m traveling; the next I’m back in school preparing assignments and presentations. Sometimes, I truly wish there were more than 24 hours in a day. Last month, right before I started my my second semester as a Graduate Student, I decided to do a small weekend getaway trip, with some of my girls, to Philadelphia, Pennsylvania. I booked us a really nice hotel room in Center City at Loews Philadelphia Hotel. We had such a breathtaking view of the city. It was one of those views that reminded you of the beauty of architecture and sunlight brightening up the sky, and the serenity created by skyscraper lights. Can you tell I love cities? Because I do. I’ll admit Philadelphia is far from my favorite city but on that weekend, it definitely grew on me. We decided to walk to our first destination. It was supposed to snow in a few hours and we wanted to enjoy walking, while we could. It wasn’t too cold so it was perfect. In the middle of Midtown Village we came across Finn McCools Ale House. Here I discovered and had my first White Russian. I don’t know much about cocktails, and at 25 maybe I should know a little more than I do, but wow was it strong. Luckily, I shared the drink with my friend. We left Finn’s very happy and probably a tad buzzed. As we walked towards the Philadelphia’s Magic Gardens we came across beautiful murals and graffiti art. Had to stop and take pictures. The Philadelphia Magic Gardens is a beautiful project that started in the late 1960s by Isaiah Zagar. It’s a remarkably stunning work of art that opened up to the public in 2008. At first sight, you can’t help but to look in awe at how detailed everything is. Every corner, every inch, is truly magical. We literally stayed there for about two hours just mesmerized by everything. We took so many pictures wanting to capture every moment we created there. It started getting colder and that was pretty much our cue to walk back towards are next destination. On the way, we stopped by Strangelove’s Bar. I’m 100% a beer girl so I was more than enthusiastic to try something new. We ended up spending about 1.5 hours just talking and enjoying our beer selection. It was a nice spot and we clearly got sucked into the vibe. Before heading to Philly, almost everyone I talked to told me to check out the Reading Terminal Market and that’s what we did next. At this point we were starving and all we wanted was food. The place was crowded and the options to eat felt endless. We ended up separating, half of us got Philly Cheesesteaks while the rest of us got some Soul Food at Keven Parker’s Soul Food Cafe. I devoured my food. It was absolutely mouth watering delicious. There’s no other way of putting it. We couldn’t leave the Market without getting some famous Beiler’s Donuts. The line was insane but totally worth it. It was early, around 7PM, but it was raining, and phones were dying, so we decided to head back to the hotel to charge for a bit. The plan was to head back out for a few more bar hops, before preparing for our evening festivities, but the bed felt too good for a few of us. The rest of the group headed down to the hotel bar. Never underestimate the hotel bar! You might just end up having a pleasant time with some fancy delicious cocktail, that you keep calling by the wrong name…yep, totally me. Eventually, we got dressed for the night. It was an interesting one to say the least. If I had to summarize the night in one word it would be random. We spent most of our night at Time Restaurant. It was a great place divided into three sections: one for dancing, one for live music and one for simply sitting and drinking. After that we somehow ended up at Wawa. That had to be the most crowded Wawa I’ve ever seen. The next day, before heading back to my house we had Brunch at the famous, and highly loved, Green Eggs Cafe. Beforehand, we had mimosas at Caribou Café, a Parisian bistro, to kill the 1 hr and 45min wait we had at Green Eggs. It was such a cute little French place it took everything in me to not order food. To end our Philly adventure we took a picture with the Love sign like any other tourist. It was absolutely freezing at this point and we couldn’t wait to get back to the car. Philly, was a good adventure. The trip definitely warmed me up to its possibilities. Philadelphia might not have the best public transportation system, but it’s not lacking great bars and places to eat. So if you want a nice weekend getaway why not give Philly a try? I did. This entry was posted in 25th Year, Food, Travels and tagged adventure, bars, changes, enjoy, Excitement, experiences, explore, exploring, Food, Friends, fun, inspiration, Latina, Latina Blogger, laugh, Life, life experience, life lessons, lifestyle, live, Living, philadelphia, Photography, pictures, places, possibility, random, restaurants, Self-Discovery, travel, way of life, Writing on February 13, 2017 by SimplyTiff. It was officially Monday; our last day in Los Angeles, California. We had to wake up super early to move our cars, and it was brutal. We were so tired from our hike the day before. On our search for a parking garage, by accident, we ended up driving by the famous Skid Row. It was by far the saddest thing I have ever seen in my life. All the poverty broke my heart. I was truly baffled and speechless. It was one of those experiences that made you grateful for what you have. A reminder to always give thanks for your blessings. At that moment I missed home. We couldn’t find the right parking garage and it was already 9:00 am. We decided to just have breakfast. Of course, we couldn’t find non-meter parking (meter prices were ridiculous,) so we decided to get our food from Poppy + Rose to go. We really wish we could have ate there because it was a quaint spot; perfect for a relaxed morning with friends. We ate our breakfast in the car and then head towards FIGat7th. I guess this is LA’s way of modernizing its downtown. Think of it as a mall. We didn’t stay long just stopped by Target, which by the way had a whole liquor area. I was pretty taken aback by that. I haven’t seen a Target with liquor in NJ. At this point, we were wide awake and just ended up parking the car at a parking place right around the corner of the apartment. It was time to get ourselves ready for Beverly Hills. Before heading out, we decided to find one of the Los Angeles Angel Wings, which is a part of the Global Angel Wings Project. We looked like total tourists and enjoyed every second of it. When we arrived at Beverly Hills we were in shock…talk about a total 180 from downtown LA. We parked and thought, “we’ll only stay for two hours max. What can we possibly do for a whole day here.” Yea, we spent our entire day in Beverly Hills without a single care in the world. It was a perfect day in Beverly Hills. The weather was fantastic and the atmosphere was peaceful. First, we came across this small chocolate shop, Diane Krön Chocolatier. Damaris wanted to get some chocolate for her family. We started talking to the owner and to our surprise she was Jacqueline Kennedy’s personal chocolate connoisseur. She was an absolutely lovely woman with so much kindness. She allowed us to taste some of her delicious chocolates and nicely packaged the chocolates Damaris purchased. It was the perfect welcome to Beverly Hills. Once we hit the main strip, we came across all the high-class expensive name brand stores that I would never shop at on a daily basis. Dior, Michael Kors, Tom Ford, Louis Vuitton, Prada, Vera Wang (wedding dress goals,) Tiffany & Co. It was all there! We walked in awe. Everything was beautiful and expensive. Surprisingly, we didn’t feel poor, even though we totally were compared to the riches we were surrounded by, which is probably why we didn’t go into any of the stores. We had lunch at 90210 Pho – A Modern Vietnamese Kitchen. The food was good and prices were affordable. We had the funniest waiter who loved that we were from the East Coast. We considered doing a tour of the mansions but ended up not doing so. We walked around some more and then came across Amorino Gelato Al Naturale. Talk about tasting the softest and most delicious gelato ever! Before heading back to downtown LA, we drove past some of the Beverly Hill mansions and swore one day we would own one. They were spectacular! With dreams in the air, we parted ways with Beverly Hills and drove right back into reality. We ended the night at the Ace Hotel Upstairs. It was interesting, to say the least. We didn’t stay long, even though we tried. I think it was 70’s night; not really our crowd. Just like that ended our final day in Los Angeles, California. California was definitely a 2016 highlight. It has always been a dream of mine to visit the West Coast. I’m glad I was able to share that with some of my closest friends. We definitely learned a lot from our trip and were able to experience things we didn’t think we would anytime soon. It just goes to show that all you really need to make a dream come true is a little push to make it happen. So thank you Steph and Damaris because only by pushing each other did we make this a reality. This entry was posted in 24th Year and tagged adventure, Beverly Hills, CA, California, chocolate, Excitement, expensive, experiences, explore, exploring, fun, inspiration, Latina Blogger, LatinasInMotion, Life, life experience, lifestyle, Los Angeles, Photography, photos, places, possibility, postaday, Self-Discovery, sights, sightseeing, things to do, travel, traveling, way of life on December 30, 2016 by SimplyTiff. Last Few Days In Cali. Time flies when you’re busy. Seven months ago, I took a trip to California with two of my close friends, and since then time has been speeding; without caring for any stop sign in sight. I never finished sharing the rest of my west coast adventures with everyone. [Catch Up] So I figured, what better way to close 2016 than by reminiscing these next few days with my readers. On Saturday, May 28, 2016, we woke up super excited because we were finally going to see the famous Venice Beach. We put on our cutest bathing suits ready to have our movie scene moment…you know, that scene where all you see is hot guys as you walk down the strip. After we ate lunch in the Los Angeles Flower District, in this small area they have closed off for food vendors (had some Salvadoran Pupusas and some fresh Horchata water,) we headed straight to Venice Beach. It took us a bit to find some parking, but when we did and got out the car, we couldn’t believe it… it was COLD! We chose the coldest day of our trip to go to the beach. Thank goodness I had my leather jacket! We walked the strip suffering from the cold, but enjoying our surroundings. It was a cool beach with a relaxing vibe. It was filled with all sorts of vendors and people exercising, biking, surfing, playing basketball, weightlifting; just doing all sorts of activities. Afterward, we went into a bar to change into our night outfits, which were also a huge fail. We all wore maxi dresses and headed to Santa Monica, CA where it seemed to be even colder. When we arrived, the first thing we did was go to TJ Maxx to get Damaris a cardigan and myself a scarf. Luckily, Damaris found a decent cardigan but unfortunately, they just finished selling the last scarf. I was disappointed, scarfs are my lifesavers for any cold emergency. We had dinner at this super chic Greek restaurant called Inotheke. The food was very delicious. It was one of those places where you wished the food portions weren’t so small because the dishes were just too good. Ye Olde King’s Head British Pub was our next stop for some drinks. We really enjoyed ourselves there to the point that we stayed till closing. Steph and Damaris played a few rounds of darts, while I mingled with the crowd. We ended our night with a stroll down the Promenade where we enjoyed some street performances since of course, all the stores were closed. On Sunday morning we woke up starving…well at least I did. I was excited because I knew we were finally going to Roscoe’s House of Chicken and Waffles. The wait was long and felt eternal! When we were finally seated and they gave me my glass of orange juice, I literally shed a few tears from how amazing it tasted! Till this day, I have not had such an amazing freshly squeezed orange juice as I did that Sunday morning at Roscoe’s. Needless to say, the food exceeded my expectations and I ate so much I probably gained a few pounds. We headed back to Albert’s apartment to put on our hiking gear and head to Griffith Observatory. The view from the observatory was absolutely stunning. Amidst all of the people, it was still peaceful to be surrounded by such beauty. Ready to workout all of the food we finished eating at Roscoe’s; we headed towards the Mount Hollywood Hiking Trail. The journey up was incredible. I kept wanting to stop and admire all the wonderful views. Probably why it took us forever to get to the top. There’s just something about a hike that makes you appreciate all of the small things. You realize all your troubles are small compared to how vast the world is. In a world that might never lack problems, hope is the one thing that we cannot lose. The sun started setting and everything seemed to be shining. It was breathtaking. By the time we started heading down we were all exhausted. The trail is about four miles up and four miles down. After eight miles, I was ready for bed, but Steph and Damaris were craving more crêpes. You would think we went to France with all the crepes they craved throughout our trip. I was suckered into getting one too at Crêpes Sans Frontieres. The restaurant was quaint and had an awesome French vibe. I couldn’t help but love it. My anything French obsession is beyond my capabilities of self-control. Then they were craving ice cream. You all should have seen my face. I can’t help but laugh when I think back to it now. Albert took us to Peddler’s Creamery. Here they made fresh ice cream in a unique way. It involves a bicycle and someone having to ride it, simply to produce the ice cream. Click on the link and check it out because it’s super cool. In the end, I was glad we got the ice cream. Finally, exhaustion dawned on everyone. It was time to call it a night. This entry was posted in 24th Year, Travels and tagged adventure, attractions, CA, California, Excitement, experiences, explore, exploring, Food, Friends, fun, hiking, inspiration, LA, Life, lifestyle, Photography, photos, places, postaday, restaurants, things to do, travel, traveling, trip on December 28, 2016 by SimplyTiff. With graduate school and work being my top priorities, it feels like I don’t have time for much. However, I realized that for not having time like I used to, I have been doing quite a lot. Yes, clearly except for keeping up with this blog, which I truly apologize for. So you may be asking yourself, what exactly have I been up to with my limited time? Well school work, of course! But also exploring my backyard. No, not my actual backyard, there’s not much there but a great space for contemplating life. What I mean is that I have been exploring New Jersey and my surroundings. I love to travel, but when you have so much going on, seeing what new adventures you may find close to home doesn’t sound like such a bad idea. I realized that for not being much of a big deal, New Jersey can be quite surprising, and with neighbors like New York and Pennsylvania can one really complain? Alright, yes, but you get my drift. My backyard exploring began with wine tasting at the Working Dog Winery in Robbinsville, NJ. There are so many wineries in NJ and PA that I have no idea why I haven’t become a winery expert by now. It’s honestly the perfect thing to do on a cool Sunday afternoon with a few friends. Where I found myself next? Well….Even though Atlantic City seems like it’s not part of NJ, well at least to me, it actually is. My best friend Shakia and I attended the 2016 Atlantic City Seafood Festival. As I walked in I asked myself if there was such a thing as too much seafood and beer? I had what, at that time, tasted like the best Crab Mac and Cheese ever! My taste buds were so happy they urged me to take a cup with me home. Unfortunately, the next day it wasn’t as marvelous. It must of been the hunger and moment wrapped into one. We came across a friendly Chowder cook-off. All proceeds went to charity so it was only right to taste ALL of the Chowders. I never had so much Chowder (corn, clam, vegetarian) in my life! I think I had enough for the next year and a half. To finish off our adventure at the AC Seafood Festival we did a beer tasting of New Jersey beers! It couldn’t have been anymore perfect! Never underestimate the power of a good ‘ol festival. There are tons of festivals all year around. Look up some festivals in your backyard and give it a try, you might just be pleasantly surprised. Philadelphia Restaurant Week snuck up on me, but there was no way I was missing out. Shakia and I ended up going to Fratelli’s Italian Bistro where I had the Stuffed Cremini Mushrooms, Penne Alla Vodka, and Tiramisu for desert. I would give the restaurant/food a 3/4. Food and service could have been better but it was still good overall. I think I’m going to make it my personal mission to indulge in Restaurant Week every time. There are just so many restaurants! And I sure do love food! Then I found myself creating art at ArteVino Studio in Hoboken, NJ for my friend Stephany’s birthday. This would make my fourth painting! Maybe I should open up my own studio at the rate that I’m going, but paint and wine events are so much fun. There’s a ton available all over, not only in NJ, NY or PA! I wasn’t really pleased with how my painting came out, but I had a great time with my friends and the experience was well worth it. I like to think that I can do it all because time will never be just right. I don’t fear stress or being tired (my newfound life on a daily basis,) but I do fear not being able to explore and enjoy the small pleasures in life. Though I’m swamped with adulthood, I will never stop looking for my next adventure, even if it’s in my own backyard, and neither should you. This entry was posted in 24th Year and tagged accomplishment, activities, Art, changes, enjoy, Excitement, experiences, explore, exploring, Food, fun, happiness, Happy, inspiration, Life, life experience, lifestyle, Living, Photography, photos, places, random, restaurants, self-acceptance, Self-Discovery, Self-Love, things to do, time, way of life, winery on October 19, 2016 by SimplyTiff. How is it that you can easily get consumed by everything going on in your life? It feels like in the blink of an eye so much has happened! It’s exhilarating realizing that a positive mentality will eventually bring you positive outcomes. Ah yes, Claire, Damaris, Stephany and myself just finished our trip to Harvard University and are now headed to dinner. Claire picked a nice little spot, Grendel’s Den Restaurant and Bar located on Harvard Square. Grendel has half price hours from 5-7:30pm where most items on their menu are half priced! (yes, we caught the special!) Also, the portion’s of food served are spectacular! We were all so full. I’m not sure how we managed not to take a nap right there and then. Damaris had a chocolate craving so next thing you know we ended up at L.A. Burdick Chocolate Cafe, also located in Harvard Square. The place was small and chic with limited seating. Luckily, we managed to score a table while Damaris ate her chocolate cake. I was super excited because as I bought my first macaroon ever (yes, ever!) there was a French couple right next to me speaking Français! Talk about the full French experience. So as any other moment when I’m indulging in French culture, I freak out and start eavesdropping; feeling super proud of myself that I understand the couple I start saying French words like a total creep. After, my moment of excitement it was time to take a bite of my hazelnut macaroon…it was perfect. We continued our walk in Harvard Square and decided to have a few beers at Charlie’s Kitchen. We found outside seating by the fire and our shivers from the cold wind quickly disappeared. You don’t realize how much you miss catching up with your friends until you sit down and look back at the moment. It’s a great reminder as to why the friendship exist. Distance isn’t a problem for true friendships. We then find ourselves at Alden and Harlow an upscale place known for its fancy cocktails and snacks. I decided to get the Common Place cocktail (Gin, Sage, Clove Honey, Lemon, Benedictine and Egg White.) I am happy to say that I ended up getting the best cocktail out of the group! **FYI this is a great date night place! We ended our night in Harvard Square at Hong Kong Restaurant which, is also a lounge and a nightclub. The night consisted of a Scorpion Bowl, a dancing bouncer and an unexpected dance battle! With exhaustion sucking our bodies dry of energy, we headed off back to the apartment pleased with our great day! Sunday arrived and so did our departure. We were truly saddened by the end of such a refreshing weekend. But before leaving we had breakfast at The Friendly Toast. What an amazing breakfast! Located in Kendall Square, The Friendly Toast is a superb breakfast and brunch restaurant with a hipster vibe and a unique menu. The service was amazing and the food beyond delicious! I couldn’t have been more satisfied with everything. I am truly proud of Claire for taking that leap into the unknown. She made a new home for herself and seemed so happy with her new life. It was truly inspiring to see her in her element. We all need to take that leap because we might find true happiness where we least expect it. This entry was posted in 24th Year, Travels and tagged adventure, beautiful, Cambridge, experiences, Freinds, Friends, fun, happiness, journey, Latina, LatinaBloggers, LBConnect, Massachusetts, photographs, places, Positivity, postaday, Self-Discovery, Self-Love, sightseeing, thing to do, travel on April 14, 2016 by SimplyTiff.